In theory, Shiftlings should be an excellent game. It's a puzzle platformer with a unique mechanic as its basis, and it is able to squeeze a wide variety of challenges out of that mechanic. It has a bright, colorful, and attractive graphical style. And it's built for two characters that can be controlled either through local co-op or in single player. The formula is there for a memorable experience, but unfortunately, Shiftlings is a game that never hits its stride. The game’s defining mechanic doesn’t translate into fun moment to moment gameplay. The movement requires too much precision to make the co-op experience enjoyable, the level design is aggravating, the story and humor fall flat, and the controls aren’t tight enough to effectively support the game’s difficulty level. These problems all take their turn spoiling the experience and keeping Shiftlings from ever getting fully off the ground. In Shiftlings, you play as a couple of little guys in spacesuits, connected by a hose. In the game’s prologue, one of them drinks a can of ultra-fizzy cola and then blows up like a balloon. 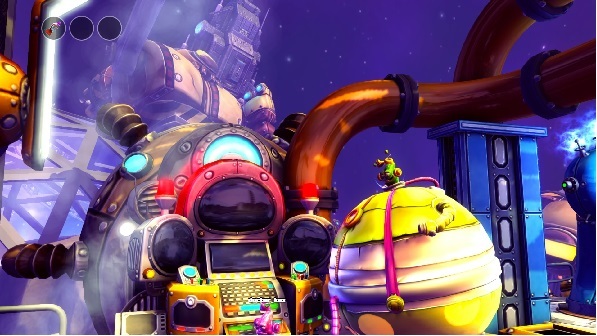 For the rest of the game, the two Shiftlings are connected, always with one of them overinflated and the other normal size. The big Shiftling can push heavy objects, pull the lighter Shiftling around, weigh down switches, and even act as a trampoline for the smaller Shiftling. The small Shiftling can squeeze through small openings, operate switches, and jump. At any time, you can tap a button to transfer all of the weight and size from one Shiftling to the other, as long as there is sufficient space for the small one to inflate. The game’s fifty levels consist of navigating your Shiftlings up, down, left, and right through all sorts of hazards and obstacles. For a game as simple as Shiftlings, there is a surprising amount of variety in these hazards and obstacles. There are five worlds with ten levels each. The game gradually introduces new game mechanics, like antigravity streams and cannons that can shoot the smaller Shiftling. Creativity abounds and the levels do a good job of getting you to experience all of the nuances of the game’s mechanics. There are a lot of charges that can be leveled at this game, but they don’t include being unoriginal, repetitive, boring, or heavily padded to extend its length. If it wasn’t called Shiftlings and you didn’t know better, then you could easily get the impression that you are playing a Ratchet and Clank game. It is very similar in its tone, humor, sci-fi setting, and colorful graphics. The announcer who occasionally interjects comments into the game is reminiscent of the announcer in a Ratchet and Clank arena, and so are the types of public address announcements that you hear and the hazards that you encounter. Unfortunately, Shiftlings is lacking in some of the charm that makes the Ratchet and Clank games so memorable. The announcer’s comments, in particular feel rather forced, and the jokes are hit-and-miss. Furthermore, the announcer doesn’t seem to have much of a reason to exist, and the game barely has a story. So, while the game makes a valiant attempt at filling the Ratchet and Clank void, it ultimately fails. Being a puzzle platformer with two characters, it is clear that Shiftlings was made with local co-op as one of its major features. It makes sense on paper, but unfortunately, the single player mode is the better way to experience the game. Shiftlings requires a lot of coordination and timing between the two characters. There are plenty of ways to fail or die, and since the Shiftlings are connected via a hose, anything that kills one automatically kills the other. The characters also die if the hose ever gets pinched. Both players can use the shifting mechanic at any time, which means that you and your partner will constantly fight each other with this mechanic unless you agree ahead of time that only one of you will use it. Unlike most co-op platformers, which are easier or allow one player to become a bubble, Shiftlings can’t be enjoyed casually. It is more convenient to tackle the game by yourself. With any co-op mode, a good litmus test is “does this mode make the game easier or more fun?”, and with Shiftlings, that answer is a resounding “no”. As a single player experience, Shiftlings fares only marginally better, despite its refreshing premise. The game has a lot of problems. Some of those problems stem from implementation, but the biggest one stems from the game’s core design. In short, having two characters connected by a hose and moving independently just doesn’t make for a fun game. You can shift control of your Shiftlings or inflate/deflate them with the tap of a button, which sounds easy enough. Unfortunately, you can play this game for ten hours and never get comfortable with this mechanic. If you played the 2013 game Brothers: A Tale of Two Sons, then you may have already experienced this problem. Controlling two characters one at a time, for some reasons, always feels clumsy and difficult. Brothers made up for this problem somewhat by being more of a pure puzzle game. Shiftlings, on the other hand, retains some traditional platforming challenge, with sequences that require swift movement and precise timing. The game is loaded with five or ten second sequences that require multiple swaps and sequential movements between characters. These sequences are very easy to screw up, killing your Shiftlings in the process or causing you to fall and replay that sequence again. For some reason, the mechanics never commit themselves to muscle memory. The game’s trampoline mechanic helps illustrate why it isn’t much fun. In many areas, you are required to use the big Shiftling as a trampoline for the smaller Shiftling to ascend vertically. In some cases, you have to walk across the screen like this, with one Shiftling continuously bouncing up and down on the other. In order to move both characters in this manner, you have to inch one forward, swap characters, inch the other one forward, swap characters, and repeat this process in tiny increments until you get to where you need to go. If you accidentally move one Shiftling too far, then the small one hits the ground and you have to start over again. It is one of many features of the game that make for a lot of frustrating and tedious moments, despite the game’s somewhat generous checkpoints. Shiftlings doesn’t help its case with some of its other flaws, another of which is its sluggish jumping control. It is barely noticeable most of the time, but it is an obvious problem when you have to get across a gap by running and jumping right as you reach the end of the ledge. Infuriatingly, the game often detects your jump too late, sending you plunging to your doom instead of making the jump like it should. If you are going to tackle this game, then prepare to accidentally run off of ledges dozens of times. You should also expect to get unfairly killed by a lot of hazards, because Shiftlings also has a habit of killing you when you are within a few pixels of a hazard, instead of when you directly touch it. You may position one of your Shiftlings close to an electric fence, thinking that you won’t get fried by it, only to be proven wrong. It would be unfair to say that the game doesn’t have its moments. The announcer does have a few good darkly humorous one-liners. The levels occasionally come together really nicely, providing the highs that you are looking for in this type of game. Unfortunately, though, those highs are usually preceded and followed by a variety of lows. At no point in the game is there a solid hour of uninterrupted fun. I don’t take pleasure in dishing out criticism to a game like Shiftlings. It is an ambitious indie title that takes chances and attempts to take the puzzle platformer in an interesting new direction. In other words, it is the type of game that this hobby desperately needs more of. I wanted to love this title, but as I reflect on my time with it, I can’t remember any prolonged play session where I truly enjoyed it. The moments of joyful fist pumping that a game of this type should provide are too few and far between, and when they do make an appearance, one of the game’s annoyances soon comes along and crashes the party. Seasons After Fall is too vague and confusing to be satisfying, and a game's graphics and music can only carry it so far. There is more than enough art in this package, but there is not enough game. The game may be guilty of relying on that sense too much, forcing you to look the other way at everything that it is missing or does wrong. Gamers who require more robust gameplay mechanics or more collectibles may find themselves underwhelmed by Skylar and Plux. They should still be able to appreciate the effort though, if not the result. Rock of Ages 2 is a fun and madcap adventure, giving you the ability to desecrate art and history, but the game has a habit of taking a little too long with each match. The humor and character carry it a long way and the battles can come to very tense nail-biting finishes, but a better balance on the damage and more interesting map designs would do a lot to help give it more legs. If you have been eagerly awaiting the continuation of the story from The Fall, then the next chapter of that story is easy to recommend.